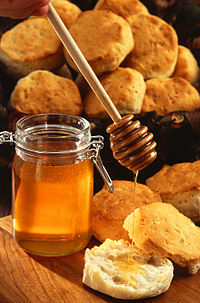 Honey is a food made by honeybees from nectar. They put the honey into a honeycomb, which for them is a storage unit. Honey is sweet and can be used instead of sugar. It is a supersaturated liquid. As the temperature drops, glucose comes out of solution. Then it is a semi-solid rather than a liquid. Honey is first mentioned in the Book of Exodus, and is often linked with pleasant and comfortable things. "Land of Milk and honey". It is also referenced in the Qur'an, with similar associations to good and evil. Much like wine, there are several kinds of honey with different tastes, colors and textures. Some common types are got from bees who use the clover flower's pollen. It is thick and has a medium color. It tends to form crystals or grains more quickly when exposed to air. Acacia flowers make another common variety. Honey from bees using flowers from oleanders, rhododendrons, some laurels, and azaleas may cause honey intoxication. Symptoms include dizziness, weakness, sweating, nausea, and vomiting. Expert beekeepers solve this problem by moving their hives to areas where the right flowers are available. Bees like to get their nectar locally, and do not go more than two miles from the hive. Honey tastes quite different according to which flowers were used by the bees. Key things are its fragrance (smell), taste and how clear it is; also the absence of bad qualities. Wikimedia Commons has media related to Honey. This page was last changed on 24 January 2019, at 19:43.